7 Next-Level Nasi Lemak That'll Make You Go "Alamak!" Nasi Lemak is a perennial favourite among both Singaporeans and Malaysians and is one that can be enjoyed any time of the day. Traditionally, Nasi Lemak is served with a fried chicken wing atop coconut milk-infused rice, before finally being topped with a dash of sambal chilli, ikan bilis and peanuts. Of course, there are several versions of this dish but regardless of which, one thing is for sure—it is a go-to for both breakfast and supper for many of us. However, trust us Singaporeans to give a twist to traditional local delights. Today, food fads are aplenty and many hawkers and entrepreneurs alike have channelled their creativity into elevating a seemingly simple dish. From luxurious nasi lemak that feature the likes of lobster to XXL nasi lemak that you can literally share with your squad, here are 7 stalls in Singapore that serve nasi lemak that will blow your mind. Proudly dubbing itself as ‘Nasi Lemak and Chicken Rice Hipster’, Adimann dishes out classic Malay delights with a twist—unlike the usual nasi lemak dishes, Adimann serves their nasi lemak with Basmati rice. 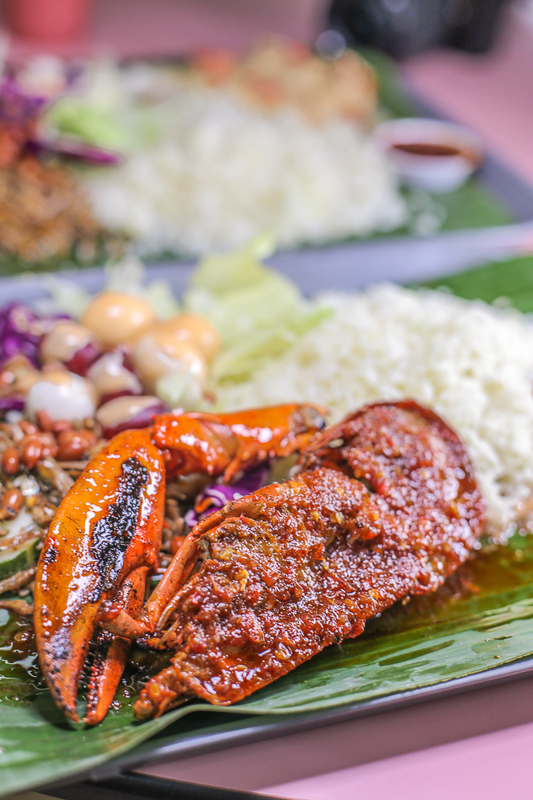 Some items that you can look forward to, include the Nasi Lemak with Fried Chicken Cutlet (S$7.50) and the Nasi Lemak Lobster (S$15)—the former resembles a traditional nasi lemak while the latter would be a good option if you want to have nasi lemak with a luxurious twist. Unlike food trends that have been taking over our social media of late, Chong Pang serves up an unpretentious plate of nasi lemak that comes with just simple ingredients and no fancy sides—just the way we like this perennial favourite to be served. Chong Pang Nasi Lemak is next-level in its own right—though topped with only simple accessories, they always serve it fresh and hot from the wok such that every plate is the best version you can get. Looking for the ultimate nasi lemak dish around that will crown your clique with #squadgoals? Daily Coffee over at Viva Business Park serves XXL versions of local dishes, of which this includes Nasi Lemak Power (S$24.90), Laksa Power (S$18) and Seafood Nasi Lemak Power (S$38.90). The Nasi Lemak Power comes with a generous serving of papadum, deep-fried chicken, chicken cutlet as well as a huge portion of fragrant coconut rice beneath the omelette—trust us when we say that this will fill 4 people, or perhaps one sumo wrestler. Hopping on to the bandwagon of all-things-colourful is Jia Xiang Nasi Lemak, who gives the traditional dish an innovative twist by serving it with blue-hued rice. Made using natural butterfly pea rather than artificial colouring to get the blue colouration, not only are the nasi lemak dishes here utterly Instagrammable, they sure do taste as good as they look! For first-timers, the Blue Rice Rendang Chicken Set is the crowd-favourite so you now know what to look out for! Featuring nasi lemak with rather unusual pairings, Lawa Bintang focuses primarily on incorporating fusion flavours into their dishes. Best known for their luxurious nasi lemak dishes—which includes crayfish, salmon, lobster and grilled squid, what makes their nasi lemak stand out would be the use of various herbs and spices to bring out the best flavours of the seafood. You can definitely bet on their best-selling Nasi Lemak Sotong Goreng (S$7.50) to satisfy you! If there is one thing that Singaporeans love more than food, it would be free-flow food. Nasi Lemak Kukus serves their nasi lemak with free-flow coconut rice and 2 variations of sambal chilli (one sweet and the other spicy)—both of which are essentials in a nasi lemak. What’s more, Nasi Lemak Kukus steam their rice to ensure that the rice is imbued with the best coconut milk flavours, so what you can expect is unlimited portions of superbly aromatic coconut rice! Well known for their nasi lemak, Walaku is a casual eatery along Joo Chiat Road that serves a variety of nasi lemak with different ingredients added to it. The Nasi Lemak Ayam Goreng Rempah (S$7.80) is the most basic version amongst all the options but it was sufficient to leave us satisfied. Featuring a huge piece of chicken thigh that is deep-fried to a golden brown perfection on the outside and succulent on the inside, Walaku’s rendition of nasi lemak will definitely blow you away.